Looking for Rock or Pop RealTracks and RealDrums? PG Music makes it easy with Rock-Pop RealPAKS 1-14! Rock-Pop RealPAKs 1-14 include a collection of PG Music's popular RealTracks and RealDrums for Rock. These are not samples, but full recordings by professional musicians that replace the MIDI track in your arrangement and play along in sync to the chord progressions you enter. 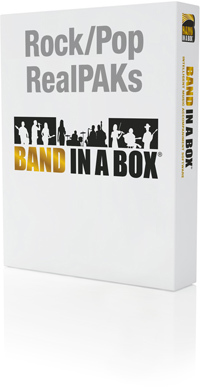 Purchase all 300 RealTracks Sets with over 2,500 RealTracks (2,700+ hours of studio musician audio recordings) in the Band-in-a-Box® 2018 UltraPAK or Audiophile Edition.